Convert iPhone videos to MP4 and other 1000+ video formats without any quality loss. Transfer videos between PC/Mac and iOS devices directly via a USB cable. Edit videos before converting with features of cropping, trimming, adding watermark, etc. "I have taken some wonderful videos with my iPhone, but how do I convert my iPhone videos to MP4 so that I can share these videos with others more conveniently?" Apple rules the world market with its iPhone. Each year, we are offered at least one version of the iPhone and the booking numbers run into millions. iPhone has been successful in cementing its position amongst users and professionals from different domains. As iPhone can take high-quality photos and is easy to carry which almost takes place of the common digital cameras. So, most people will have the same problem to save iPhone videos to MP4. Don't worry, here we'll introduce you the best iPhone video converter for you to convert iPhone videos to MP4 or other video formats and transfer to iPhone/iPad easily. 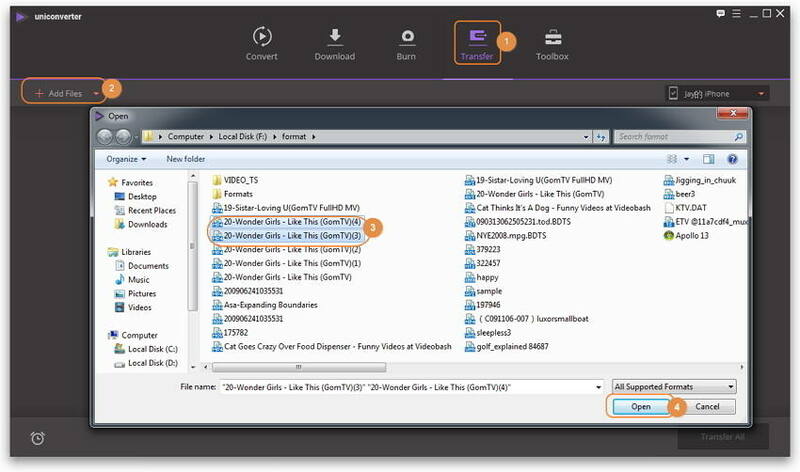 As a powerful desktop application, Wondershare UniConverter (originally Wondershare Video Converter Ultimate) has succeeded in helping numerous customers with their video conversion needs. Playing with a number of formats has now become easy as Wondershare UniConverter (originally Wondershare Video Converter Ultimate) comes with the capability of processing files from different formats and delivering the output as per your requirements. It can also help you compress video size without losing any quality. With this iPhone video converter, watching, sharing, and enjoying videos at any device have been made feasible as you can now opt for different formats while converting their videos. 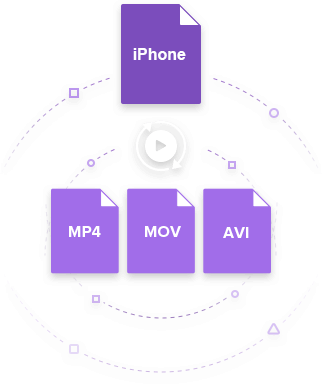 Directly convert iPhone videos to MP4, AVI, MKV, MOV and 1,000+ other formats. Convert iPhone video to MP4 in batch with 30X faster speed compared with common converters. Burn iPhone videos to DVD or Blu-ray disc to play with your DVD player with free DVD templates. Customize iPhone videos with trimming, cropping, adding watermark, editing subtitles, etc. Compress video size for iPhone and other mobile devices without any quality loss. Step 1 Launch Wondershare iPhone converter and import iPhone videos. Download and install Wondershare UniConverter (originally Wondershare Video Converter Ultimate) on your computer, and then launch it. Connect your iPhone with your computer, it will be detected by Wondershare iPhone converter. Click the inverted triangle beside Add Files and select Add from Device, check your wanted iPhone videos from the pop-up window, and click Add to Convert List to load the files. Step 2 Set the output format as MP4 for the iPhone to MP4 conversion. Choosing the correct format is imperative while converting your video. Click the drop-down menu next to Convert all files to: option. Select MP4 as the output format and the desired video resolution from the Video tab. If you want to convert MP4 to iPhone, then you need to select the output from the Device tab. 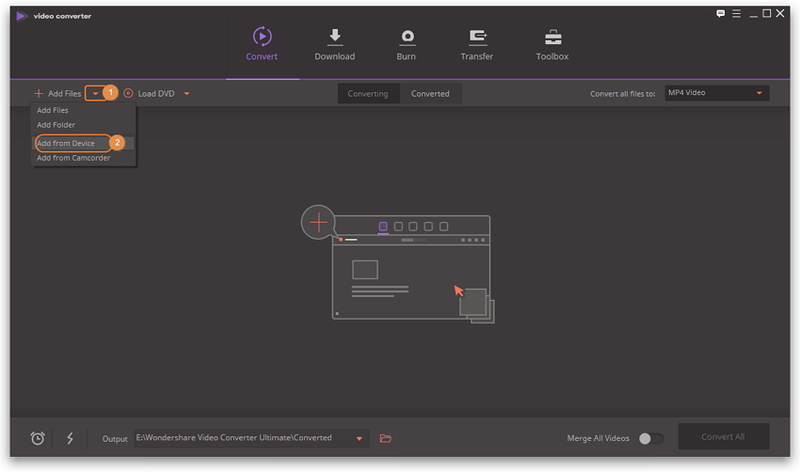 Wondershare UniConverter (originally Wondershare Video Converter Ultimate) gives you the option to edit your videos before you initiate the conversion process. Unlike many other video editing tools, this one is fairly simple and has an interface that is easy to understand for any user. 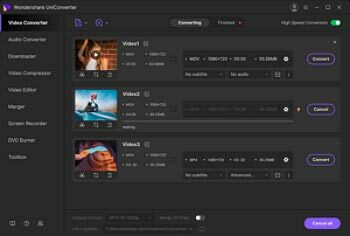 Using this free editing tool, you can trim or crop the unwanted parts, add subtitles, apply free effects to your video and apply filters. Do not forget to save changes. Learn more about how to edit iPhone videos here >. Step 4 Initiate the conversion process of iPhone video to MP4. Finally, click Convert All button to start the conversion process. This starts the conversion of your iPhone video which is in .mov format to MP4. The conversion process lasts for only a few minutes, at a pace, which is faster than all other common video converters in the market by 30 times. You can find the converted MP4 file at the Output folder. 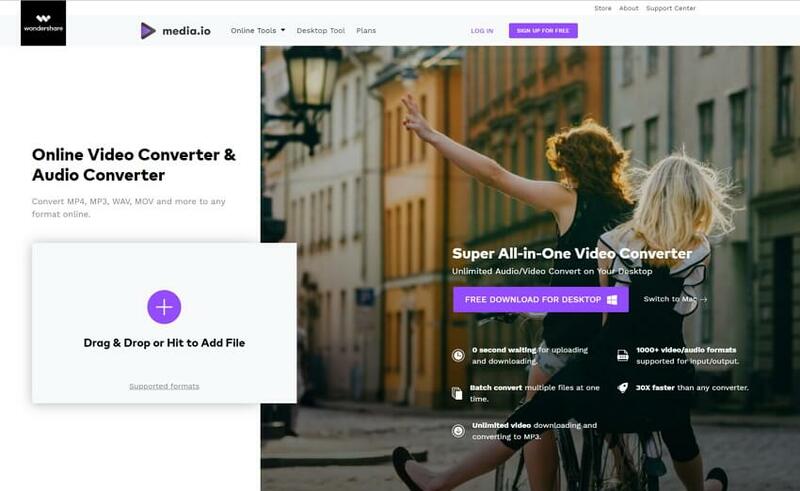 Step 1: Open Online UniConverter (originally Media.io) (https://www.media.io/) in your browser, and you'll come to the convert interface by default. Make sure that your iPhone videos have been transferred to your PC/Mac. Step 2: Click on the + or Drag & Drop or Hit to Add File button to choose the iPhone video you want to convert to MP4. After that, choose MP4 as output format by clicking on the Convert all files to or the to button. Step 3: Finally, click on the CONVERT button to convert your iPhone videos to MP4 format easily and free. You can download the converted files directly or save it to Dropbox for easy sharing. As you know, it's very easy to transfer iPhone video to computer, you can use AutoPlay on Windows and iPhoto on Mac, and you can search these solutions very easily on website. But it's not easier for you to transfer video from computer to iPhone without converting the original videos. As if you use Apple's iTunes, it will sync the new videos with erasing the original videos. So we will recommend a good way to transfer videos from computer to iPhone without any video lost. 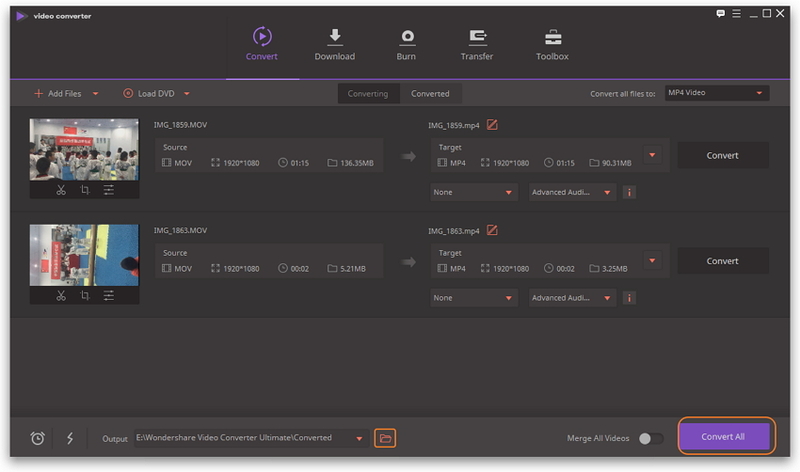 As a full video solution, Wondershare UniConverter (originally Wondershare Video Converter Ultimate) still provide the video transfer solution without iTunes installation, please see the following steps for reference. Firstly, you need to launch Wondershare UniConverter (originally Wondershare Video Converter Ultimate), and plug in your iPhone to your computer using a USB Cable. You can click the Transfer section and click Add Files to browser and add files from your computer. If you only connect one device with your computer, then the default device will be iPhone. Or you need to choose the iPhone at the top-right corner firstly. After loading the videos, click Transfer All to start the video transfer. If the video from your computer can't be compatible with iPhone, the converter will intelligently detect and convert it to the iPhone friendly format while the transfer. 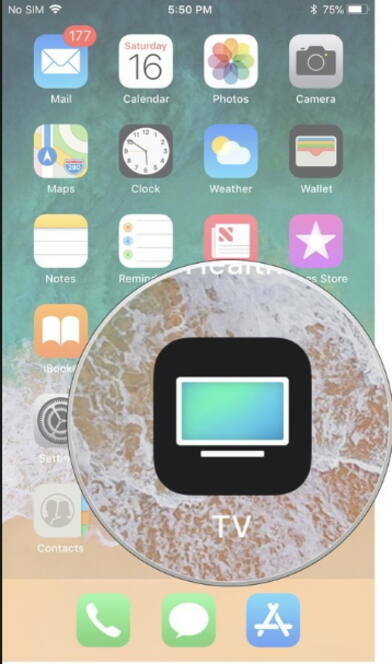 You will find the video in the TV app (Old version named Video app) on your iPhone. With Wondershare UniConverter (originally Wondershare Video Converter Ultimate), you can be assured of a friendly interface and a quick pace to transfer video between iPhone and computer. Why not download it to have a free trial now?